Grace Episcopal Church was established in 1851 by parishioners of Trinity Church. The present Grace Church represents the second oldest church in Chicago and is at its sixth location. The first Grace Church, described as a “little wooden box,” was located at the corner of Dearborn and Madison Streets. The Rev. Cornelius F Swope served as the first rector until 1854. At what is now East 8th Street and Wabash Avenue was the next location of Grace Church. It was there that the “Golden Era” of Grace was begun in 1859 by the installation of the Rev. Clinton Locke as rector. 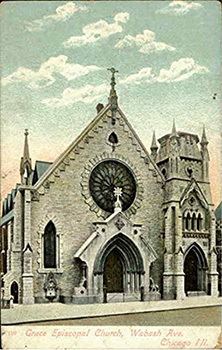 This period of social, theological and civic excellence lasted until 1915 when a fire destroyed both the church and chapel of the third Grace Church at Wabash Avenue between 14th and 15th Streets. The damaged parish house was repaired by the parishioners under the leadership of the vestry and the rector, the Rev. William Otis Walters. It served as a place of worship for the congregation for the next ten years. The fourth Grace Church at 1450 South Indiana Avenue was formally consecrated in 1929. Its work was dedicated to the benefit of St. Luke’s Hospital. The Rev. William T. Travis’ rectorship was a period of renewed growth for the church. A considerable number of Chicago’s Loop business men and women were involved in both Grace Church and the work of the hospital. In 1966 the fifth Grace Church was dedicated at 33 West Jackson. The decision to move to the Loop renewed the Church’s historical dedication to the business people of the City and began an era of ministry to the Loop community. The present Grace Church and Community Center, Grace Place, was opened in December, 1985, at 637 South Dearborn Street. The Rev. William L. Casady, rector from 1979 to 1989, led the move to the Printers Row location and spearheaded the acquisition and renovation of a former commercial building. Following plans by the architectural firm of Booth Hansen, the building was converted into a unique, award-winning loft-sanctuary on the second floor, with the large open hall on the street level to be used for church and community affairs. In the mid-80’s, the Dearborn Park area was changing and growing into a neighborhood. Another small South Loop parish, Christ the King Lutheran Church, in its search for space, began sharing the facility. In the years since, many other faith communities have shared, or are sharing, facilities with Grace Church in Grace Place. Grace’s former Rector Ted Curtis just retired on May 2015, after 24 years of service (the 19th to serve this church). The Rev. Amity Carrubba became Grace’s 20th rector in August 2016. In 2001 Grace Church celebrated 150 years of witness and service to the Near South Side of Chicago!